Has anyone heard the classic John Philip’s classic where he tells people “if you’re going to San Francisco, make sure you wear some flowers in your hair”? What we do, as residents around the Bay Area, is to do exactly that. A dainty flower headband will bring light onto any outfit this fall. Of course Anna Sui, whom we consider the queen of bohemian chic, bloomed her fall line with heads of flowers. You might gawk at this overpriced accessory, but we found an alternative at CrewCuts (the children’s section at JCrew) and aren’t afraid to admit it ($16.50, www.jcrew.com)! Now, we think Louis Vuitton is quite possibly timeless. 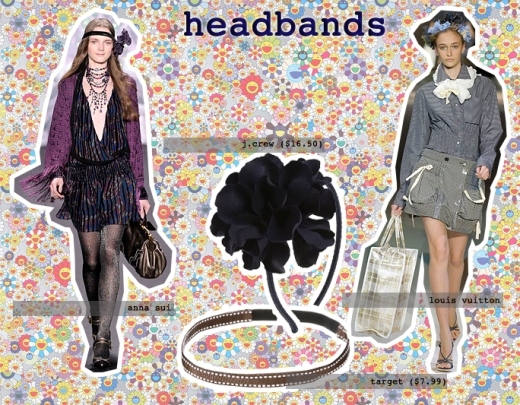 Marc Jacobs did a French-esque collection for last year’s fall line and we’re still in love with the amazing headbands. To get this amazing look, we think it’s a good call for a DIY project. Just buy these reusable stretch headbands from Target ($7.99 for 2, www.target.com) and hot glue various plastic florals (which look amazingly real, by the way) at Michaels (prices vary, www.michaels.com). Boring flyaway hair can be tamed and beautified by adding flowers-real or natural- in your hair! What a fabulous idea! I have that "boring flyaway" hair as you call it, and this is such a fun and easy crafty project that could look real cute. Thanks for the tip!